Acacia senegal sensu O. B. Mill. 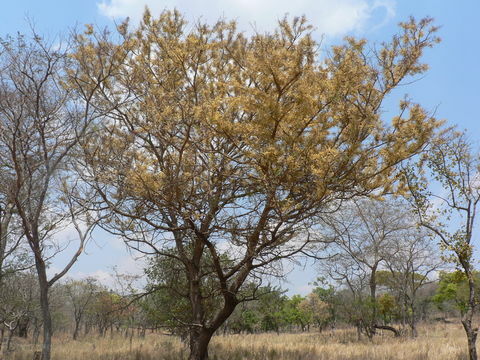 The monkey thorn (Acacia galpinii Burtt Davy) is a large deciduous tree of Southern and Eastern Africa. 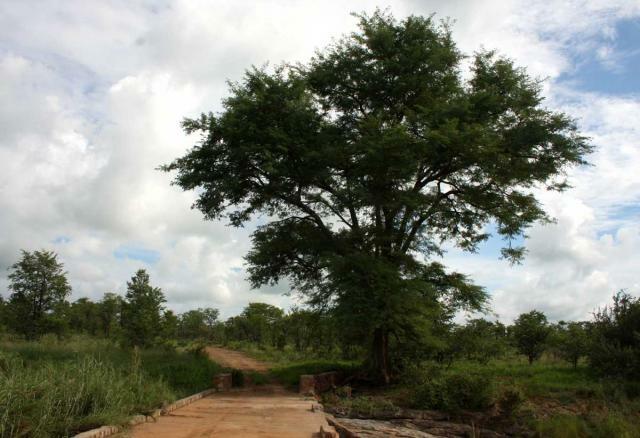 A fast growing, long-lived tree, with a maximum height of 30 m, Acacia galpinii is the largest South African acacia. The trunk is 2 m in diameter. The bark is whitish-yellow in young trees and darkens with maturity. The wide spreading branches form a rounded canopy (UVP, 2014; Lemmens, 2006; Schmidt et al., 2002). The branchlets bear pairs of hooked and blackish prickles up to 1 cm long just below the nodes (Lemmens, 2006). The leaves are alternate, bipinnately compound, bearing 7-14 pairs of pinnae, each with 12-35 pairs of small hairless leaflets (4-10 mm long x 1-3 mm wide). The inflorescences are borne in clustered spikes from October to January (UVP, 2014). The flowers are creamy white, with a reddish calyx. The fruits, which ripen between February and March, are 8-15 seeded dehiscent pods, straight, large, papery to woody, 8-20 cm long x 25 mm broad, reddish to purple in colour. The seeds are flattened and ovoid, 12-15 mm x 10-12 mm (UVP, 2014; Lemmens, 2006; Schmidt et al., 2002). The monkey thorn provides valuable timber for construction and fences. It is grown as an ornamental tree in large gardens, parks and avenues. The sweet-scented flowers attract bees and other insects. The pods are eaten by animals but not as readily as those of other Acacia species (Lemmens, 2006). The monkey thorn is a native of South Africa and occurs in the north of South Africa, Tanzania, Malawi, Zambia, Botswana, Zimbabwe and Mozambique at altitudes ranging from 350 to 1500 m above sea level. It grows in riverine woodland, but can be found scattered on termite mounts and in open woodland. Monkey thorn trees are most common on loamy or clayey soils. They thrive in full sunlight. Old trees withstand frost (Lemmens, 2006). The monkey thorn is a fast growing tree, easily propagated from seeds. Seedlings and young trees are sensitive to frost. Young trees may require pruning of their low hanging branches. Leaves are shed during the cool season and pods need 6 months to ripen (Lemmens, 2006). The monkey thorn is an N-fixing tree that nodulates readily, has some resistance to drought and grows quickly. It is, therefore, a potential pioneer tree that can be used for afforestation in dry areas (Lemmens, 2006; Mlambo et al., 2004). It was successfully established in semi-arid areas of Botswana (annual rainfall below 450 mm), where it had lower mortality (only 1%) and developed much faster than Faidherbia albida (Walker et al., 2008). The monkey thorn provides dappled shade, suitable for lawns, and nesting for many bird species. It is attractive to bees and wasps (Lemmens, 2006). 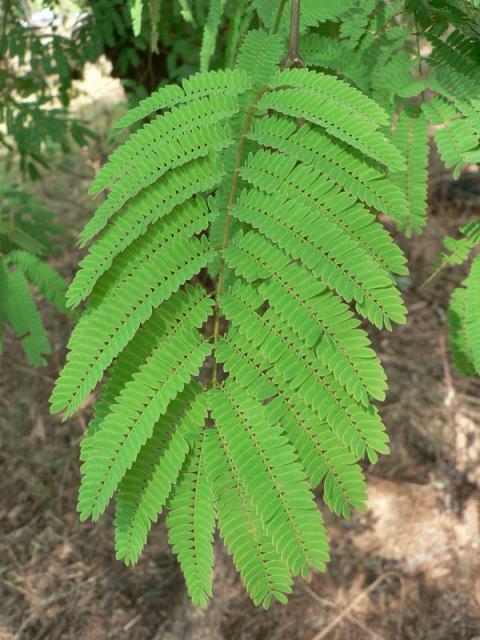 Monkey thorn foliage has a moderate protein content (12-19% DM), a moderate fibre content (ADF 32-37% DM) and relatively large amounts of condensed tannins (2.2-7.5% DM) (Mokoboki et al., 2005; Mokoboki et al., 2011). Monkey thorn foliage contains relatively large amounts of condensed tannins (2.2-7.5% DM) (Mokoboki et al., 2005; Mokoboki et al., 2011). 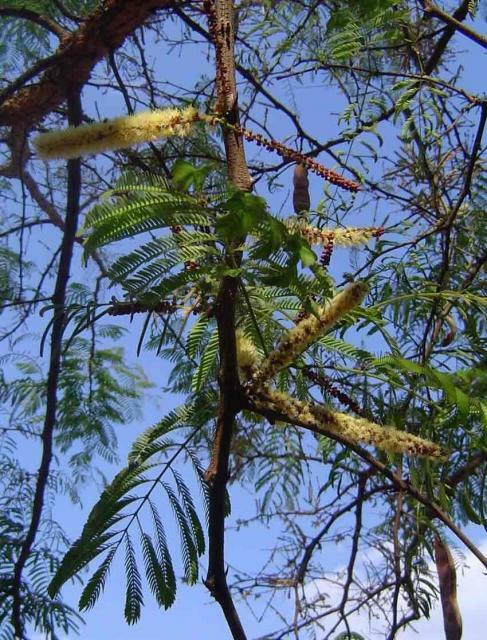 Information about Acacia galpinii is scarce. Monkey thorn pods and foliages have been assessed in the Limpopo Province in South Africa where they could offer a potentially suitable source of supplementary protein for ruminants thus improving intake and digestibility of native pasture. Physical properties indicate that monkey thorn foliage has a high intake potential. However, in vitro DM and OM digestibilities were respectively 38% and 35% which was low compared to other Acacia foliages. It was, therefore, concluded that monkey thorn had only a low potential as a forage for ruminants (Mokoboki et al., 2005). Mutshinyalo, T., 2003. Acacia galpinii Burtt Davy. South African National Biodiversity Institute (SANBI).